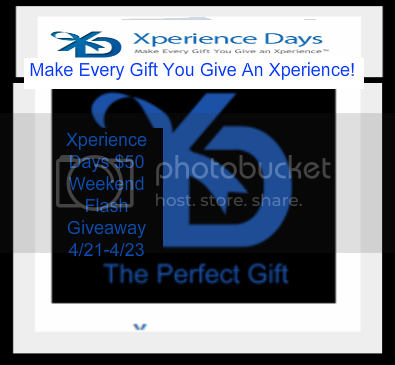 For the weekend, let's have some fun with a Xperience Days $50 Flash Giveaway. I'm helping my friend, Detroit Mom & Her Views, post her giveaway. Xperience Days is the country's leading Unique Gifts, Adventure Gifts and Experience Gifts company, offering thousands of unique gift experiences nationwide. They offer the perfect range of unique gifts for men, experience gifts for women or activity gifts for couples. Experiences make perfect gifts ideas for Christmas, Weddings, Birthdays and more. Gifts are presented in the form of a gift certificate which may be redeemed by the recipient at their convenience. All experience gifts are sent in an attractive gift pack.